My name is Heather. I live just north of Toronto, Canada with my husband and son in a cozy little house full of yarn, stitching, and Lego. I’ve been stitching since some time in middle school (that’s grades 6-8), which means I’ve been stitching for more than 25 years. My grandmother had actually tried to teach me to stitch when I was much younger, but I was hopeless. Then, on a shopping trip with my mom down in the U.S. 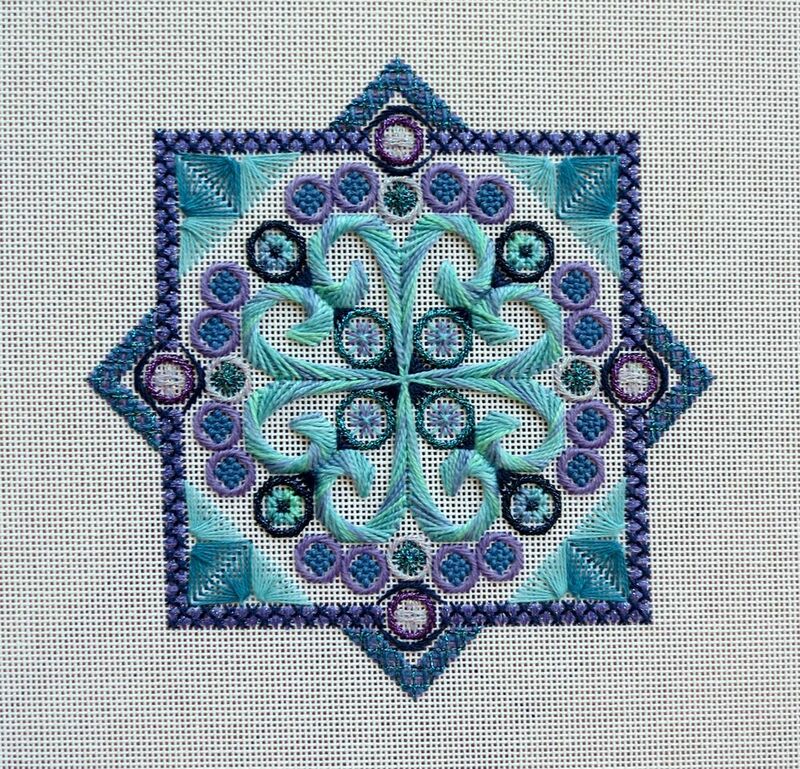 I came across a stamped cross stitch design that I loved. I bought it, stitched it up and I’ve been hooked ever since. I’d like to think my grandma would be very proud of me. I’ve been blogging since July 2003, and most of those posts are still available on my blog. However, my focus was different back then (more based on Tarot, etc.) and I’ve culled some of earlier posts. Back then my blog was called Reflections in the Pond and it was an extension of another site I ran. 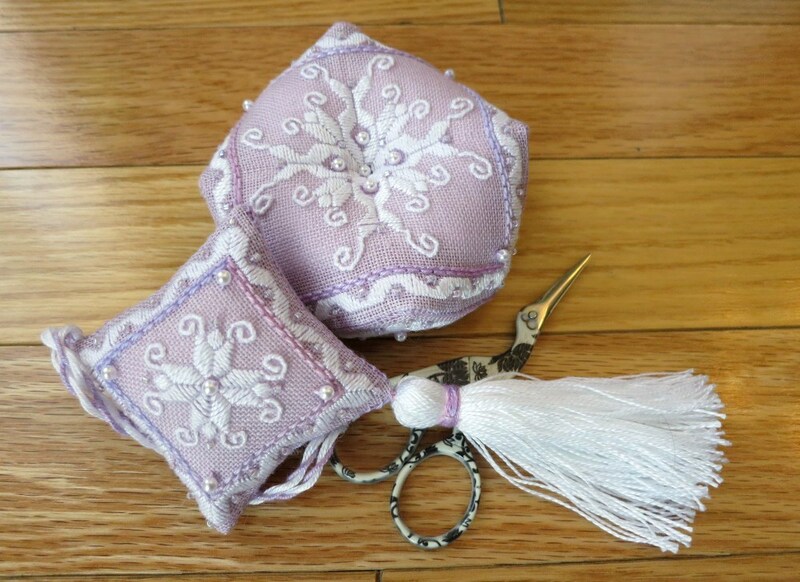 I changed focus to needlework back in 2009, and I changed the name to Stitching Lotus (a play on my alias of Silverlotus) in 2012. 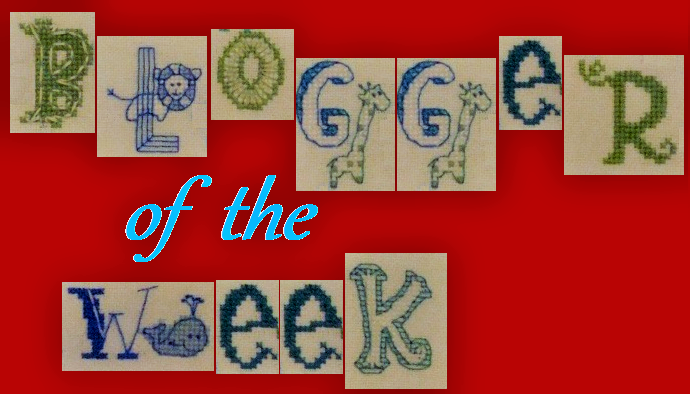 I started blogging about my needlework because I wanted a place I could share what I was working on. At the time I didn’t have many real life stitching friends, and the ones I had I rarely saw. I get out a bit more now (especially since my son is no longer a baby), but I’m still very shy and sharing things online is much easier for me. I jump around a lot, even though I would love to be more focused. For the past few years I’ve been trying to focus more on special projects, like the stockings I’m stitching for my family. I also start and complete a small project every month for a stitch along that I host. Teresa Wentzler is my favourite designer. She is so talented, and I think we have all missed out on so many wonderful designs due to her retiring from designing. Overall, I’m very drawn to more realistic (or at least not cartoony) fantasy designs. Mirabilia and Passione Ricamo are some more of my favourites. I also really like Jennifer Aikman-Smith’s designs—her dragons are just adorable. And an honourable mention goes to Laura Dickson of Enchanting Lair. Her outlined dragons and clever book and box designs are wonderful. Canvaswork is another passion of mine, and I especially love the work of Carolyn Mitchel and Lorene Salt. It is really hard to choose just one. But if pressed I would say Chang Er Moon Goddess by Pinn Stitch that hangs in my bedroom. It doesn’t have any beads or speciality stitches; nothing makes it flashy or special looking, I just happen to really love it. I was about a third of the way through Dragon Dream’s Santa’s Dragon, on hand-dyed fabric, when I realized that it was so badly off centre I wouldn’t have anywhere near enough fabric on one side to stitch it all let alone frame it. Instead of picking it all out I just binned the whole thing. It made me feel so much better! 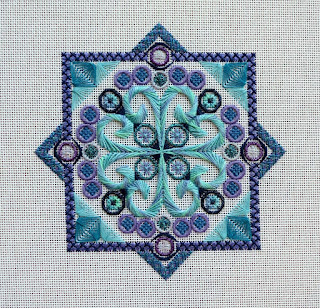 I’ve got a kit from Gingerbread Girl Designs for a technique called Casalguidi embroidery. It is a set of absolutely beautiful cupcakes with all the materials for stitching and finishing. But, to be honest, I’m very nervous about starting it. I don’t want to mess it up! I have piles of things that need to be made into ornaments or frame. They live in a box in my craft room closet waiting for the day I finally get around to them. My favourite way to finish something is to make it an ornament. That’s why I love doing smalls on perforated paper—add a hanger and you’re done! I lick my floss and sometimes I tie knots. Oh, and my backs aren’t very neat! Don’t be afraid to change designs. You are the boss of your stitching, so change colours, use a different fabric, leave things out or add things. Create something that you will be proud to hang in your home. Hello there!What a wonderful piece Chang Er Moon Goddess is!AriadnefromGreece! Lovely to learn more about you and your stitching Heather. 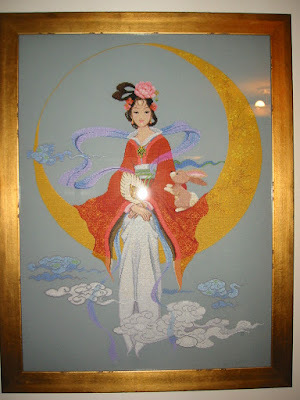 I think Chang Er Moon Goddess is beautiful. Hi Heather, nice to meet you! Your Moon Goddess and that canvas project look amazing. I'm thinking about joining in on the smalls SAL if you host it again next year! Nice to meet you, Heather! You do lovely work - the canvas piece is gorgeous, and the stockings and Moon Goddess are beautiful. Very nice to meet you Heather. I can see why your Chang Er Moon Goddess is your favorite, it is gorgeous. Love your Gingerbread House also. It was interesting to read all your answers, Heather. It's so nice to know a bit more about you now. Your Goddess looks fantastic. 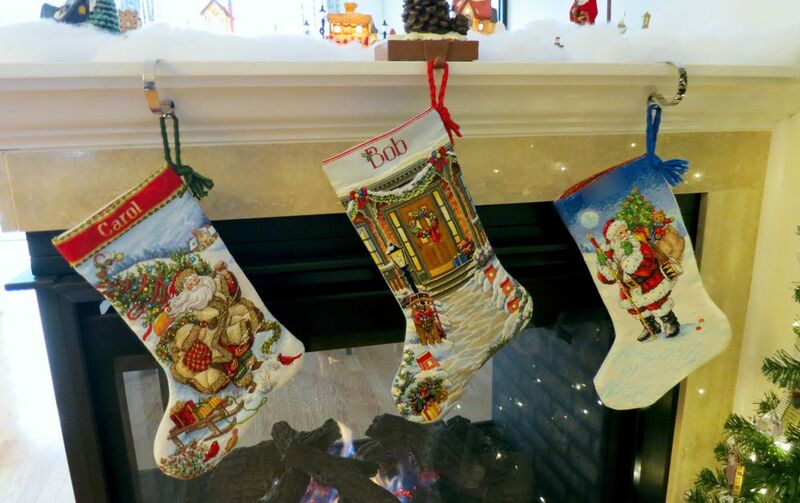 And the stockings are just gorgeous. Such a lot of wonderful stitching and finishing to be seen with your answers. Great post, Heather, so very lovely to learn so much more about you. I can see why you love the Goddess - she is stunning! Love your Christmas stockings, too - a great long-term project to have on the go. So great to learn more about you. I wish I had known (or rememebered?!) that you lived near Toronto when we were there last month! Your stitching is lovely and I love your advice, that's how I stitch. Nice to learn more about you Heather.